This Holiday Inn is situated in Cordele 4 miles from the Watermelon Capital Speedway. It has a fitness center, an outdoor pool, and offers air-conditioned guestrooms with free Wi-Fi. 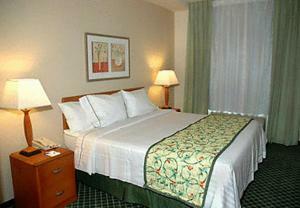 Rooms at the Holiday Inn Express Hotel & Suites Cordele North are spacious and include a work desk. They come equipped with a microwave and a coffee maker. Some rooms have a separate seating area. In the morning, guests can enjoy a cinnamon roll or a cheese omelet. Several restaurants serving barbecue and international cuisine are located less than 2 miles from the hotel. The Sam Shortline Railroad offers railway tours of Georgia and is less than a 10-minute drive from the hotel. Georgia Veterans State Park is 9 miles away. Nearby leisure activities include fishing, walking and golfing. When would you like to stay at Holiday Inn Express Hotel & Suites Cordele North ? This twin/double room offers 1 extra large double bed or 2 large double beds. This double room offers 1 extra large double bed. This suite includes a microwave and refrigerator. A seating area with a sofa and flat-screen TV is included. This room has a roll-in shower. This room has a bathroom that can accommodate up to 36 inches for a wheelchair. This double room offers 2 large double beds. All children are welcome. One child under 19 years stays free of charge when using existing beds. There is no capacity for extra beds in the room. Each day we'll check prices and send you an email for your selected dates at Holiday Inn Express Hotel & Suites Cordele North. If you don't have specific dates but would like to check prices for say next weekend or say next month we can check the price too. Click to write a review and share your experience of Holiday Inn Express Hotel & Suites Cordele North with other travellers.